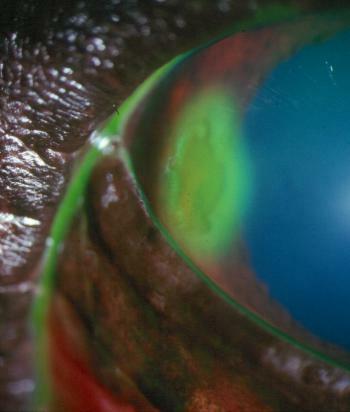 This boxer is presented with a recurrence of a corneal ulcer. What classic feature is evident and what would your treatment be? These recurrent corneal ulcers, or should we say epithelial erosions, are caused because the epithelium is non-adherant to the underlying stroma because of a defecet in the epithelial basement membrane. They are seen in boxers and West highland white terriers as well as some other breeds. 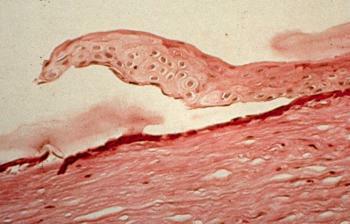 Here a histological section shows the non-adherant edge of the epithelium precluding further healing. Treatment involves debridement of this devitalised tissue and encouragement of healing with a grid keratotomy with protection of the healing ulcer with a third eyelid flap or contact lens. Two very useful recent papers on this condition are from Chris Murphy’s group in the States: (Morphology and immunohistochemistry of spontaneous chronic corneal epithelial defects (SCCED) in dogs. Invest Ophthalmol Vis Sci. 2001 42:2262-9, Spontaneous chronic corneal epithelial defects (SCCED) in dogs: clinical features, innervation, and effect of topical SP, with or without IGF-1. Invest Ophthalmol Vis Sci. 2001 42:2252-61)but here are two other papers which might be easier for vets to access (RG Stanley et al: Results of grid keratotomy, superficial keratectomy and debridement for the management of persistent corneal erosions in 92 dogs. Vet Ophthalmol. 1998 1:233-238, SE Kirschner: Persistent corneal ulcers. What to do when ulcers won’t heal. This entry was posted in Cases and tagged corneal epithelial basement membrane dystrophy, Corneal ulcer, dog. Bookmark the permalink.